One hot August night, we were planning a walk to the Hotel Oloffson for a nightcap. That was when The Man Without A Country informed us that if we tried to do so, we would be lying dead in the street within minutes of our proposed departure. He offered to drive us, and we arrived in time to order bottles of Prestige beer, just before the electricity failed and Port-au-Prince went completely dark. We sped back to our hotel, chased by wild dogs. The Man Without A Country cursed as the car swerved. During the day, the city had been very much alive. Youngsters wearing the red stockings of the national team pulled high-kicked balls in the park off the Rue de Champ de Mars. The streets--named for John Brown, Jean-Jacques Dessalines, Jean-Paul II, Martin Luther King, Haile Selassie--teemed with people. The colorful tap-tap trucks, which provide much of the public transportation, raced about filled with people. That evening we fell into conversation with The Man Without A Country at the hotel bar. He was Lebanese-Haitian. He could not, he said, return to Lebanon. Nor, apparently, was Haiti safe, since within weeks it would explode in a military coup. At some point, the subject switched from corrupt governments and the plight of oppressed people. The United States, someone said, would be playing host to the World Cup in 1994. The next night, Stade Silvio Cator was jammed with 40,000 people. The stadium's namesake had been possibly the world's most remarkable athlete of his era. Silvio Cator was the first man to exceed 26 feet in the long jump, in 1930; he was also captain of Haiti's national team in soccer. There have been many larger-than-life figures in Haitian history and many of them are remembered by statues in the Place des Heros de l'Independance. But the largest monument to a national hero is the stadium itself. Thousands had entered the stadium early in the afternoon, exposing themselves to the baking summer sun. We entered through the locker room and were greeted by the insistent sounds of Boukman Eksperyans blasting from portable speakers. By the 6 p.m. kickoff, the stadium was overflowing, and fans were literally holding onto the floodlight stanchions above the walls for a view of the match. The atmosphere was charged as ever in Port-au-Prince. “Simmering,” said The Man Without A Country. Jean-Claude Nord, the gigantic president of the Federation Haitienne de Football, greeted us with a flourish of Creole and then sat in a large green-vinyl chair. We went to field level to copy the lineups from a radio announcer, who could have been in his teens. Dozens of curious Haitians crowded around us. There were hints that Jean-Bertrand Aristide would attend the match. The American Embassy people feared that he “would cause too much commotion” and were relieved that he never appeared. Just after the match started, we noticed the radio announcer talking excitedly and rapidly behind us, still surrounded by dozens of young men. The young American players were clearly shocked by the speedy aggressiveness of the Haitians but held firm and counterattacked. The Haitians deflated following a missed opportunity. The Americans took the lead as Dante Washington scored from a long through ball. Lightning bolts filled the sky and the predictable soaking rainstorm crashed over the Montagne Noire. Glass bottles shattered off the goal and littered the net behind the American goalkeeper. The Trinidadian linesman took a stone to the back of the head. Jean-Claude Nord bustled from his comfortable chair down to the playing field and personally appointed a substitute linesman. The stadium cleared out during the delay. The Americans scored again, then streamed into the locker room. The Racing Club bus, brightly painted like the tap-taps, pulled up to the locker room door. Security men from the U.S. Embassy quickly funneled in coaches and players. As we approached the gates, stones crashed against the windows and the driver's head was split open. The bus careened through the crowds, past the statue of the Marron Inconnu, and delivered us to the hotel. A mere Olympic qualifying match had become quite eventful. The next day, The Man Without A Country took us back to the Oloffson to meet Aubelin Jolicoeur. Jolicoeur, Petit Pierre in Graham Greene's novel, The Comedians, has been a court jester and journalist, and who knows what else. He told us of seeing Joe Gaetjens play against an all-star team in 1943 at Parc Le Conte, which would later be renamed to honor Silvio Cator. Jolicoeur attempted to explain what had happened to Gaetjens and other Haitians since those happier times. But there seemed to be no satisfactory explanation. Haiti had become a land filled with fear and suspicion, its great spirit tested by awesome influences from the outside and cruel forces within. 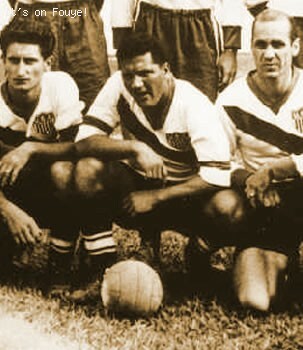 When we began the search for Joe Gaetjens, we had little to go on except pictures of him facing Bert Williams with the ball in the back of the English net; Gaetjens smiling as he is borne on the shoulders of the Brazilian fans, plus the accounts of those who were in Mineiro Stadium in Belo Horizonte, Brazil, when the U.S. defeated England, 1-0, June 29, 1950, in the most unimaginable of upsets. Most reports of the game were filled with incredulity. The British thought the goal was a complete accident. Gaetjens' teammates attributed the score to Gaetjens' resourcefulness. In any case, the goal had assured Gaetjens' name of a semblance of immortality. Gaetjens' story after that game is less clear. He played professionally in Paris and Montpellier, with and against legends such as Ernst Happel; one year, he offered to return his salary because he had not performed to his own expectations. He returned to Haiti, opened a chain of dry cleaning stores and became a celebrity spokesman for Colgate-Palmolive. In July 1963 he was arrested in front of his store on Rue Pavee, taken to Fort Dimanche prison and, presumably, executed. However, no death certificate exists for Gaetjens. There has been no official acknowledgment of his arrest or imprisonment, or even his existence, by the government. Maybe he remained alive, living in anonymity somewhere in the Haitian countryside? Within minutes, we turned onto a dirt road. The area was deserted except for an underfed bull, which straggled through the weedy swamp. The prison was empty, its terror chambers having been closed after the Duvaliers departed, and sounds echoes. “At midnight,” The Man Without A Country said, “they would call a name. That person would write his name on the wall and they would take him behind another wall.” He led us toward a courtyard. This, then, was where Joe Gaetjens had been killed. Far from the magical Mineiro Stadium, where the joyous Brazilians had carried him off the field. Far from the modern boulevards of Paris, far from New York City, where he established a reputation as a bon vivant. Gaetjens' family has sought justice. He had apparently never faced criminal charges, leaving no justification for his arrest, much less his death. But, since no records were available, Gaetjens could only be treated as a missing person for seven years following the reporting of his absence. Or so Gaetjens wife, Lyliane, was told. Gaetjens' brother, Gerard, who would be assassinated by zenglendos, or bandits, the week before we arrived in 1991, had pulled political strings. The family established a Joe Gaetjens Foundation in New Hampshire. The Organization of American States and the Human Rights Commission made inquiries. A benefit match was organized by Clive Toye and the New York Cosmos in 1972. When Gaetjens' son, Richard, grew old enough to learn the truth, he returned to Port-au-Prince, searched out his father's executioners, and confronted them. He wrote a play about his father's final days, and there was hope that Sean Connery would have a role. “His two best friends killed him,” said Richard Gaetjens, who has an acting career in Los Angeles. “I talked to the one who pulled the trigger. He did not tell me that he shot him. He just put his hands up in the air. Joe Gaetjens was an inspiring sporting figure, of divine stature to his countrymen. In the end, though, he was like thousands and millions of other Haitians who have met inexplicable and unaccountable death. They are People Without Names. Their spirit lives on.